A family run business dating back to 1887. Capezio is a manufacturer of dance shoes, apparel and accessories. They offer hand-crafted customised shoes to meet customers’ specifications. Capezio has made shoes for world-class productions such as Chicago, Black Swan, Mama Mia!, The Wizard of Oz, and countless others. 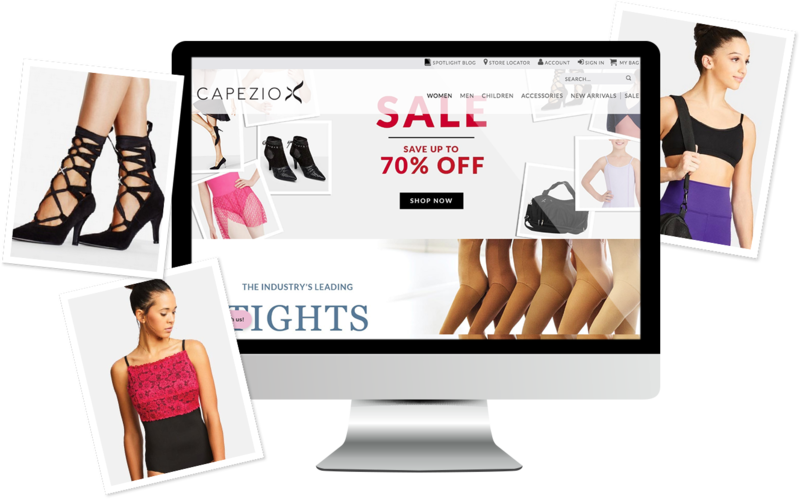 Capezio’s global Magento enterprise edition multi-store, wanted a trusted and experienced company to ensure code quality was done at the highest level. They required support to improve the overall cosmetic look and extend functionality to provide customers with an improved user-friendly shopping experience. Furthermore, we provided our technical skills to extend existing functionality and cosmetic improvements to the overall responsive website. This included creating and integrating new modules for improving the user experience. With quick product previews on the category page, including colour swatches to visually preview configurable product options. To help customers promote products more easily, an extension for referring friends was integrated. To reduce the bounce rate and create a faster web experience, we identified speed issues and offered recommendations for optimisation. Capezio was impressed with our technical expertise and ability to meet deadlines. They are extremely happy to see their Magento store now performing faster and at a higher quality. With the newly extended functionality, this had led to increased customer retention and a rise in revenue on their global website.